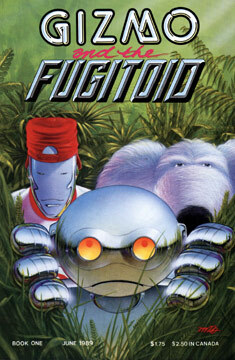 Intergalactic mercenaries Gizmo (the robot) and Fluffy (the big dog-like alien) travel through space traffic to get to their new assignment, “six weeks of light but exciting duty on a tropical paradise planet.” But once they arrive, our heroes discover that the world is anything but paradise. Unfortunately the duped duo can’t leave early as their ship has been impounded until their tour of duty is complete. As the guys transverse the rain-soaked jungles with their fellow “vacationers”, they’re attacked by a giant monster that kills several soldiers before the others scatter in effort to save their lives. Gizmo and Fluffy manage to escape the beast, and once they slow down to take stock of the situation, they stumble upon the prone form of a robot that has obviously been broken down in the forest for quite some time. Fortunately, Gizmo is a techno wiz and he gets the ‘bot fired up (while almost frying himself). The slumbering robot is none other than Professor Honeycutt, better known as the Fugitoid. Honeycutt retells his origin and explains how he had managed to elude the Federats by constructing a space-glider that landed him on this jungle world. Unfortunately, there was no advanced, intelligent race on the planet that could assist the Fugitoid, and after days of roaming, his robotic body shut down to conserve energy. As it turns out, we discover that Gizmo and Fluffy were hired by the Federats to patrol the planet – news which alarms the professor. The trio make camp together and spend the next several days trying to find their way back to the base. Fugitoid manages to locate the Federat headquarters by observing the flight paths of troop carriers and calculating where they were coming from and going to. The next problem they face is getting passed the soldiers that are guarding the impounded spacecraft. Fugitoid comes up with a plan to disguise themselves as hardened L.U.R.P.S. (long-range reconnaisance patrollers), who have a reputation for being tough and mean. The ruse works and the frightened guards let our heroes pass without question. As it turns out, Gizmo and Fluffy’s ship, ‘Soto, has a robotic brain, which Gizmo activates remotely. The ship disables a nearby guard and the guys climb inside and blast off… but as soon as they break into outer space, they’re caught in the pull of a Triceraton tractor beam!